Congress should have enrolled in its own re-education program. By passing the Military Commissions Act (a.k.a. the torture bill), Congress has granted the Bush administration extraordinary powers to detain, interrogate and prosecute alleged terrorists and their supporters. Anyone anywhere in the world at any time may be summarily classified an “unlawful enemy combatant” by the executive branch, seized and detained. Only aliens are subject to military trials (I’ve updated my original post here to more accurately describe persons subject to military commissions; see sec. 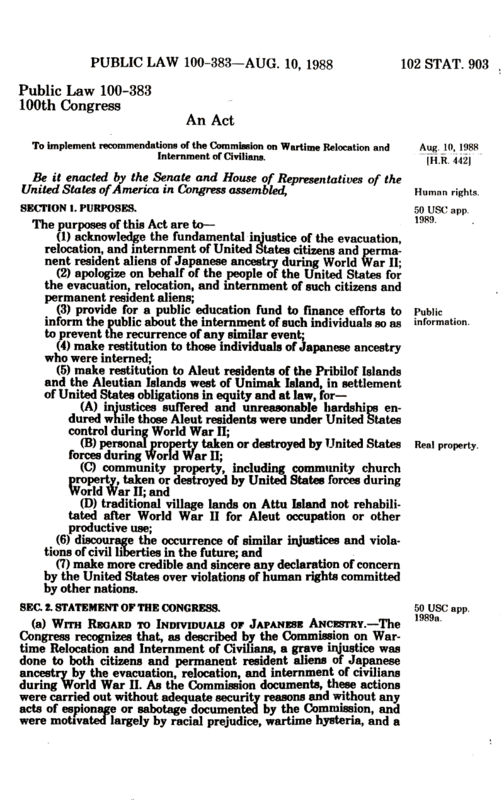 948a-c in text of legislation). As Bruce Ackerman points out in the LA Times, the definition of “unlawful enemy combatant” includes those who “purposefully and materially supported hostilities against the United States” (by say, writing a check to a Middle East charity) and may extend to US citizens. Thanks to the Supreme Court’s decision in Hamdi v. Rumsfeld, US citizens at least appear to retain habeas corpus rights, a foundation of Western jurisprudence. Foreign nationals do not; the Act explicitly denies them the writ of habeas corpus (the right to be charged and tried and the right to appeal any convictions in a court of law). These wartime powers rival and exceed those assumed by Roosevelt during WWII. Even worse, unlike the case of Executive Order 9066, Congress has given President Bush the stamp of legislative authority. In this context, perhaps the most craven vote cast for the torture bill came from Senator Arlen Specter. Though he believes the bill to be “patently unconstitutional on its face,” he voted for it anyway because he hopes “the court will clean it up.” But there’s no reason to believe the courts will act in such a manner. Moreover, Hamdan v. Rumsfeld, the Supreme Court case that temporarily jeopordized Bush’s extra-judicial detentions, specifically cited lack of Congressional approval. Now Congress has given him this approval. For those who believe that mass internment can never happen again, the US now holds 14,000 detainees in prisons in Iraq, Guantanamo, Afghanistan and other undisclosed locations. 14,000 people who can be held indefinitely, without a fair trial, by secret evidence to which they have no access or that may be obtained by what most consider torture. 14,000 and counting. Never again is now.